One weekend a few months before my dad died, he and my mother attended a wedding of the daughter of one of their friends. It was a cold Saturday, and a rather dressy wedding, so my mom borrowed one of her sister-in-laws’ fur stoles to wear. Of course back then, kids didn’t go to weddings unless they were part of the wedding party, so I stayed behind at my aunt and uncle’s house. But before they left for the wedding, it was photo time, and my mom and dad posed, all dressed up, in front of the living room fireplace. I actually remember standing beside my uncle giggling, as he took their picture, which is framed and proudly displayed in our family room. And if you look very closely, you’ll see a little girl reflected in the mirror at the top left corner of the photo, which was taken before the days of digital photography where we can do re-take after re-take until we get it just like we want. Today we would have edited that little girl out of the picture so we’d have it perfect! But to me, it’s perfect just like it is. 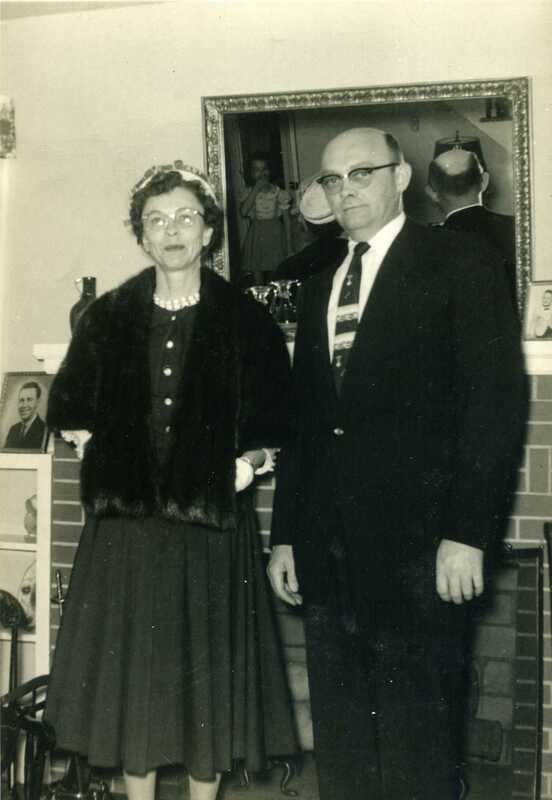 It’s one of the last photos taken of my mom and dad together, and my mom’s even smiling (something she rarely did when pictures were being taken). It’s even more special because I’m in it, too. And no one even knew until the pictures were developed. Today we call it photo-bombing. I call it another precious memory that I wouldn’t trade for anything, because I have very few pictures with the three of us together. Even though this one wasn’t planned, it’s still perfect! Sometimes in our striving for perfection, we overlook those unplanned special moments that will never come again. They’re memories that get erased because they don’t look perfect. They’re real-life. And real life sure isn’t perfect. Do you sometimes look in the mirror and wonder who that is looking back at you? Wonder where the time has gone? Do you sometimes imagine you’re seeing a second reflection in that mirror…a reflection of your younger self in the background looking ahead to the person she’s now become? Do you think that younger you you’re seeing ever expected your life to be what it is now? I’d love to know what that younger me in that picture used to think when she saw herself in a mirror. I don’t really remember, except that I didn’t like the way my mother made me wear my hair (those permanents we had back then were awful – and we all had them at one time or another), and I hated my teeth because they were ugly (oh, what wonders braces can do!). I wonder what she’d think now, seeing herself grown up, married, with a daughter and a granddaughter! What she’d think of my career choices, and more importantly, my life choices. Or maybe you see a reflection of the person you’re becoming in the next several years…and you don’t like what you see. But if you don’t, there’s certainly time to do something about it; it’s never too late, you know. But here’s something else to think about…not only about that younger you looking back at you in the mirror…but what about the other people looking at you? Do you see yourself as you think others see you? Or do you see yourself as you’d like to be, but don’t think you have a chance at being? Your reflection in the mirror is no more perfect than an un-airbrushed or unedited photo. But it’s real. Just like all the photos in your phone and on your computer. As much as we’d like, the photos we take today, unless we take the time to edit them all, are still like the old ones we cherish from the past. Honest, and truthful – showing us how we really are. As for me, I want my reflection to tell who I am, or should I say, who I hope I am. But my true reflection is who others see me as. And I’m not sure I’d always be happy knowing what that is. I’m not that little girl making faces in the mirror any more. That was some almost fifty-eight years ago. And we aren’t those same people any more, but we are a grown up reflection of who we were. So what is your reflection like today? I hope mine mirrors someone who is loving, compassionate, and a good wife, mother, and now grandmother. Many more pictures will be taken over the next years, and posted for the world to see. I hope mine still reflect the wonder in that little girl’s face as she watched her mom and dad getting ready to go to that grand event. The little girl who had no idea what life had for her in the future. And still doesn’t, because I still have many years ahead, I hope, to continue to make that future happen!